Montana and Wyoming rank in the middle of the pack in a new evaluation of the health of the US. Montana comes in 22nd and Wyoming 26th as the healthiest states in the country. Montana remained the same as last year while Wyoming reached its poorest ranking since 2001. 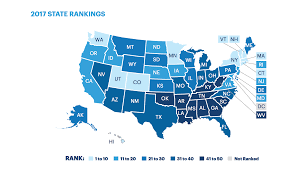 The report by the advocacy group United Health Foundation evaluated states on 35 factors in five categories that included behaviors, clinical care, and outcomes.